Where Did You Come From, William Myers? My father, grandfather, and great-grandfather were all named William Myers. Beyond that, though, the line goes dead in terms of anything I can prove. It’s very frustrating since it’s my name! In doing genealogical research, we start with the most recent information we can find and work backwards. My grandfather William Myers doesn’t appear in any contemporaneous records with his parents because birth certificates weren’t required in 1906 when he was born in Perquimans County, North Carolina. His mother Josephine Emma Goodwin died in March 1909, followed by her husband William Myers in October 1909. There are no death certificates for either one, depriving us of another source of information, but family lore says they died of the flu. No wills, orphans records, or burial records have been found. My great-grandmother’s sister Lurinda Goodwin Curtis took in orphaned William, Percy and Nellie Myers, who grew up with her family. They are listed together in the 1910 census. So let’s see what else we can find by going back to the 1900 Census. William Myres (38), his wife Josephine (26), and son Percy (3) were living in Bethel, Perquimans County, North Carolina. William and Josephine had been married for 6 years; she had born two children, only one was still living. All of them were born in North Carolina of parents also born in North Carolina. William was a farmer on rented land. His birthdate is listed as January 1862 and hers, December 1873. No North Carolina marriage records were found, but my grandmother remembered that her husband’s parents were married in Virginia and not North Carolina. Why she remembered this is a mystery; her husband was only 3 years old when his parents died in 1909, so he barely knew them and she never met them. But remember she did, and it opened possibilities. William Myers and Joseph [sic] Emma Goodwin were married on 27 Dec 1893 in Suffolk, Virginia, about 55 miles from their 1900 home in Bethel, North Carolina. The marriage record shows that William, age 26, was born in 1867; his parents were listed as David and Margaret Myers. Joseph, or Josephine, age 20, was born in 1873 to parents Lemuel S. and Mary J. Goodwin. Already we have a discrepancy. The marriage record gives William’s birth information as 1867 while the 1900 census, taken 7 years after the marriage, gives the date as January 1862. Josephine’s information is consistent across the two records. Her parents, Lemuel Goodwin and Mary Jane Thach, grew up in Perquimans County but had moved to Suffolk, Virginia, sometime before December 1893. The Myers were more elusive. In fact, they’re missing. One of the benefits of online rearch is the ability to do “sounds like” searches, which is handy when there are many ways to spell a name. And there are many ways to spell Myers, among them Meyers, Meyer, Myer, Mayer, Meirs, Mears, Maiers. Unfortunately for me, I found no marriage record for a David Myers (of any spelling) and anyone named Margaret in North Carolina or Virginia. I also found no William Myers (of any spelling) born in 1867 in North Carolina or Virginia. One promising William Myers (born to David Giles Myers) was born in 1861 in Davidson County, North Carolina, but follow-up research showed he lived and died in Davidson County and married someone else completely. There is, though, a David Myers born about 1837 in Chowan County, right next to Perquimans County. He appears in the 1850 census at age 13 in the home of Thomas Myers, his wife Minnie, with siblings Alexander (21) and Harriet (15), living in the District Below Edenton. In 1860, the only David Myers in the county appears in Edenton, where he was age 24 and working and living as a bookkeeper in a hotel. David Myers enlisted in as a private in Company M, North Carolina 1st Infantry Regiment on 29 April 1861 and mustered out on 12 Nov 1861. His name on the Roll of Honor appears as N.D. Myers. And then he disappeared from Eastern North Carolina. One Nathan David Myers died on 18 January 1917 in Kinston, Lenoir County, North Carolina. According to the obituary in The Kinston Free Press on 20 January 1917, he was a native of Edenton and had served in the Confederate Army. Sound familiar? He has a widower who died childless; his wife Eveline Dunn Myers died in 1894. I believe that this man was the David Myers who we found in the 1850 and 1860 census records in Chowan. Meanwhile, back in Perquimans County in 1870, Alexander Myers lived with his wife Harriet and children William (10) and Margaret (9). There was only one Alexander in Chowan and Perquimans County; he is presumed to be the son of Thomas and Minnie Myers, parents of N. David Myers already discussed. William is also living with Alexander in the 1880 census as well. His birth year of 1860 or 1861 is consistent with the birth year of William Myers found in the 1900 census but not consistent with the birth year of William Myers on the 1893 marriage record. Do we have an explanation? No. One possibility, however, is that Willliam was actually the son of David Myers who was raised by his brother Alexander. I have no proof of that at all and it may be far-fetched. DNA evidence does connect my father William Myers with a known descendant of Alexander Myers and another descendant of Whitaker Myers, who was related to Alexander’s father. It proves nothing but it certainly is interesting! Categories: Genealogy | Tags: ancestor profile, chowan, myers, perquimans, profile, research | Permalink. My dad grew up living with his mother’s parents in rural Martin County, North Carolina. He called them Poppa and Sade. Poppa was William Jesse “Bill” Keel, born 22 August 1872 in Bear Grass, Martin County, to James L. Keel and Elizabeth (Betsy) Bowen, the second of their ten children. Bill was raised and worked on his father’s farm with his brothers and had a fifth grade education. He was a strong man who loved to hunt and fish as well as farm, and had a big laugh. Sade was Sarah Annis Peal, born 7 September 1874 in Cross Roads Township, a small community next to Bear Grass. She was the second of seven daughters born to William Ashley Peal and Jane Elizabeth Stalls and was named for her paternal grandmother, Annis Gurganus. Sarah was a farmer’s daughter who was well educated for the time, going to high school for three years. She was a tiny woman with fine bones and a sweet smile. Sarah Peal and Bill Keel married on 6 January 1892 in Cross Roads, probably at her home; she was 19 and he was 21. Their families knew each other; both of their fathers were general farmers in the county and both attended the Bear Grass Primitive Baptist Church, which Sarah and Bill attended for many years after their marriage. When their daughter Susie Lanier Keel (my grandmother) married in July 1927, what she remembered most about her wedding was that her parents didn’t attend. Since she was probably pregnant at the time, it is possible that they disapproved of either the marriage or her husband. The newly-wed Myers were living on the Keel farm seven months later when their first child (my father) was born. Both generations lived together in the same house for the next twenty five years, first with Bill Keel as head of household and later, Bill Myers as head with his in-laws in the home. Poppa Keel farmed and did road construction work until they moved to Williamston in 1925. My dad remembered that his grandmother did almost all the cooking for the combined household while his mother worked as a seamstress to bring in extra money. Poppa Bill Keel took Daddy fishing and also hunted to provide more food for the family; their farm cousins kept them well supplied with produce but protein was expensive. Bill Keel was the man in charge of barbeque whenever a hog was butchered; those were always social occasions with many family and friends to share the food and the occasion. They were poor and lived simply. Sarah Keel died at home in Williamston on 28 June 1948. She was 73 years old. Her beloved husband Bill Keel died almost exactly four years later on 26 June 1952. He was seventy nine years old and had been in ill health for five years. They are buried together in Williamston’s Woodlawn Cemetery next to their daughter Susie Keel Myers. Categories: Family, Genealogy | Tags: ancestor profile, ancestors, keel, north carolina, profile, research | Permalink. My great-grandfather William John Flanders (aka W.J. or Bill) was an Englishman who emigrated to the United States in his twenties and became a U.S. citizen five years before his death. He was short (5’6″ tall) and had a bit of a paunch, topped by a round face sporting glasses and a moustache. He loved cigars. He married twice and fathered two children, both sons. This farmer’s son lived in New York City and the New Jersey suburbs and was a gentlemen’s clothing salesman. William John Flanders was born on 25 March 1865 in the small market town of Mildenhall in Suffolk, England, later the home of an RAF airforce base. He was the second of five survivng children born to William Flanders and Elizabeth Deeks Webb. His father was a farmer and successful breeder of hackney horses. The family lived within a 25 mile radius in the English Fen Country for almost 300 years. In the 1881 English census, we find William and his brothers Horace and Frank as scholars at a boarding school in Kings’ Lynn, Norfolk, England, 35 miles from their home. William, also known “Willie” to his brothers, came to New York City in 1885 or 1886 – we don’t know why or exactly when, but we do know that his older brother inherited his father’s land and horse breeding operation. As a second son, Bill would have known he would not inherit; the decision to try new things in a new place is not surprising. His younger brother Frank also moved to New York City in 1888. Bill Flanders worked as a clerk in Manhattan and on 7 October 1889, he married Bessie Jane Read of Sandwich, England, who was living in New York. His brother Frank witnessed the marriage. Bill and Bessie lived in Manhattan for nine years; their only child, Lester Maris Flanders, was born on 1 January 1891. The family went back to England in September 1892, making the outbound and return sailings on the new ship Mohawk, built by the Harland & Wolff, the firm that also built the Titanic. Bessie and Lester traveled to London again without William in July 1894, also on the Mohawk. Four years later, on 3 October 1898, Bessie died at their home on the Upper West Side in Manhattan. She was 32 years old. Her body was taken to England, where she was buried. After his wife’s death, Bill and his seven year old son Lester rented rooms from the recently widowed Alice McCormick and her daughter Charlotte on Hunts Point Road in the Bronx. A year later, he married the landlady’s daughter in a ceremony held at the bride’s home on 7 December 1899. He was 13 years older than his bride, who was 13 years older than her step-son. Their only child, William Charles Flanders, was born ten months later on 5 October 1900 in Belleville, New Jersey. The Flanders lived in Newark and William worked across the river in New York City. In 1907 they bought a new home in the quiet residential area of Forest Hill, two blocks from the train station to the city. The household was multi-generational and included William and Charlotte, mother-in-law Alice McCormick, his son Lester, their son William, and Charlotte’s brother, Charles McCormick. Good thing there were five bedrooms! They probably saw a lot of Charlotte’s Heginbotham cousins living in neighboring Belleville, some as close as two blocks away. The Flanders were members of nearby St. Mark’s Episcopal Church in Forest Hill. Bill took the train to work from Forest Hill to New York City and later, to points west of New York, but in 1918 they also bought a used Oldsmobile for $665. We know that the family rented a “bungalow” in Ocean Grove, New Jersey, during the summer of 1920, the same year that Bill Flanders became a naturalized United States citizen. Bill passed his love of the Jersey shore to his son, who bought houses in Manasquan in 1934. William John Flanders never returned to England after his trip in 1892. He died on 29 April 1925 at his home in Newark after suffering for 18 months with bladder and rectal cancer. He is buried in East Ridgelawn Cemetery in Passaic, New Jersey, next to his second wife, Charlotte, who survived him by over forty years and never remarried. Categories: Genealogy | Tags: ancestor profile, ancestors, flanders, great-grandfather, profile | Permalink. My mother’s paternal grandmother was Charlotte Ann McCormick, aka Daisy, aka Goggy, a name she got when her granddaughter couldn’t pronounce Grandma. She was born in Manhattan on 6 August 1878 but shaved a year off of that at some point, telling people it was 1879 as eventually appeared on her death certificate. Charlotte was the daughter of Irish immigrants Peter McCormick and Alice Heginbotham, the eldest of two surviving children. Their first child died at birth in 1876. Her younger brother Charles Thomas McCormick was born November 1881. Given the similarity of their names, they were probably named for someone specific but who is a mystery; their grandfathers were Thomas and Patrick. Charlotte and her brother Charlie were raised in different religious traditions. Our undocumented family legend is that Peter (Roman Catholic) and Alice (Protestant) agreed to raise sons in his faith and daughters in hers. True or not, they had one of each and their children were so raised. I am a descendant of the Protestant daughter; my godfather was the grandson of the Catholic son. Charlotte was confirmed on Good Friday 1892 in St. Andrew’s Episcopal Church in Harlem, three blocks from their home. The McCormicks lived on the Upper East Side of Manhattan when Charlotte was born, later moving up to Harlem and still later, to Hunts Point Road in the Bronx. Peter was a stone mason and builder and their family was well enough off to afford having a servant. Alice’s father lived nearby. Charlotte completed eighth grade and received a diploma from the Harlem Young Women’s Christian Association in June 1897, certifying her proficiency in stenography and typewriting. As far as we know, she was never employed to use those skills and it was a bit of a surprise to the family to discover that she ever had them. Charlotte’s father Peter died in December 1898 at their home in the Bronx. Following his death, her mother Alice took in boarders, including the recently widowed William John Flanders and his 8 year old son Lester. William married the landlady’s daughter one year later on 7 December 1899. He called her Daisy. Charlotte was 13 years younger than her husband and 13 years older than her step-son. The new family lived with Alice in the Bronx in the 1900 census but by 1905 had moved across the Hudson River to Newark, New Jersey. Their son William Charles Flanders (my grandfather) was born in October 1900 in Belleville, where most of Alice’s Heginbotham relatives lived. In 1908 the family moved the short distance to 916 Lake Street in the quiet Forest Hill residential suburb, near the cousins and only blocks from the train which William took for his work as a gentlemen’s wear salesman. Charlotte lived in this house until her death in 1967. Charlotte’s household was multi-generational, as were most households of the time. The 1910 census shows that her new 5-bedroom house held Charlotte, her husband and their son, her step-son Lester, her mother Alice, and her brother Charlie. These were the days before Social Security, when families formed the safety net. The women in my family didn’t work and had no real marketable skills, but they could care for a home and help raise children. And in this generation, the women outlived their husbands by many years. Although her husband traveled for business, Charlotte wasn’t lonely with a number of cousins within a short walk from her home, including her cousin Edith Karr just two blocks away. The family regularly attended St. Mark’s Episcopal Church near their home. Her husband William Flanders, who was born in England, became a United States citizen in January 1920. He died of cancer on 29 April 1925, leaving 47 year old Charlotte a widow living with her son – and still her mother, who passed away two years later. Charlotte’s son married in March 1927, bringing his bride Marion Cooke home to live with his mother in the home where he grew up. Charlotte controlled the kitchen and cooked all the meals until World War II, when she couldn’t figure out rationing. Her granddaughters grew up with their grandmother in residence, in the same way her son grew up with his grandmother there. She outlived her daughter-in-law, who died in 1960. Goggy was in her 80’s when I was growing up and she was always old. She wore plaid cotton housedresses with pearls, earrings, and either a cameo or diamond bar pin, all of which were gifts from her late husband. Her hair was soft white and curled, and she never seemed to do much, but then, at that age she didn’t have to. She enjoyed her drinks on Friday evening, and every evening for that matter, and was cared for tenderly by her son. She fell on her birthday in 1967 and died shortly later from complications of a broken hip. She is buried at East Ridgelawn Cemetery in Passaic, New Jersey, with her husband and mother. Categories: Genealogy | Tags: ancestor profile, ancestors, charlotte, flanders, great-grandmother, McCormick, profile | Permalink. My mother’s maternal grandmother was Jane (Jennie) Morrison Cooke, born on 2 October 1871 in Larksville, Luzerne County, Pennsyvania. She was the fourth of five children born to Scots immigrants Charles Morrison and Margaret Brookmire. Her parents were founding members of Snowden Memorial Presbyterian Church in Larksville and Jane was baptized there on 28 October 1872. The 1870’s were difficult years, including the deaths of two of Jane’s four siblings. Her father Charles, an injured Union veteran of the Civil War, was a coal miner who survived a mining accident and suffered probable brain damage. He was admitted to the Danville State Hospital for the Insane in November 1874, leaving his wife Margaret and three small children to fend for themselves. He owned no property, so there was nothing to inherit. It is possible that Margaret worked as a nurse, an occupation she was known to perform in later years. In 1880 Jane’s mother Margaret married again in Wilkes Barre, PA, telling her children that their father was dead, although he still a patient in Danville Hospital. Jane did not know of the deception for many years. By spring 1890, the family had moved from Pennsylvania up to New York City, where her step-father Andrew Seger grew up. He worked as a boot maker but was disabled due to injuries received in the Civil War. Jane’s sister Isabella married in Brooklyn in 1890 and her brother John in 1895. Their father Charles died in the hospital in November of that year. Jane Morrison married Robert Thomas Cooke on 9 August 1899 at South Third Street Presbyterian Church in Brooklyn. It’s possible that they met through their parents: Jane’s step-father Andrew Seger and Robert’s father William Cooke were both shoemakers in Brooklyn. Through their married life, Jennie and Robert lived in Brooklyn and Queens, moving back and forth between boroughs. They had two children, daughter Marion Stokes Cooke (my grandmother) born in May 1902 and son Leighton Brookmire Cooke, named for his grandmothers Eliza Leighton and Margaret Brookmire, born in March 1904. By 1920, Rob and Jennie’s home included their children and her mother and step-father, who were in their 80’s. Rob died on 2 September 1925 in Brooklyn, and Jennie moved across the Hudson River to 900 Lake Street in Newark, New Jersey, five houses down the street from her daughter Marion. She owned the home, valued at $13,000. Her mother lived with her and in 1930, so did three boarders. When her mother died in 1939 at age 93, Jennie moved to Madison, New Jersey, and lived with her son Leighton and his family. She died on 25 March 1946 in the Home for Aged Women in Newark. Robert and Jennie enjoyed each other, their children, and their extended families, who also lived in the New York area. They were not wealthy but their lives were comfortable. He worked as a “paper dealer” or salesman (details not known) and she kept the house and raised the children. As a family, they attended South Third Street Presbyterian Church. Jennie was an expert needlewoman who made beautiful cutwork pieces that are still being used today. She passed that love and skill on to her daughter Marion, who graduated from Pratt Institute with a degree in trade dressmaking. Categories: Genealogy | Tags: ancestors, cooke, Genealogy, morrison, profile | Permalink. I didn’t know who Anna Conway O’Connor was but I had a privately printed copy of her Last Will and Testament, dated 1926 and probated in 1928. It was with other documents that came from my grandfather’s house. Why we had it was a mystery, and why we held on to it for almost a century without knowing who she was is yet another one. So what did it tell me? At first reading, I was struck by how much money she was giving away in pre-Depression New York. Ten thousand dollars here, ten thousand dollars there — which is $146,000 in 2018 dollars. That was a lot of money! 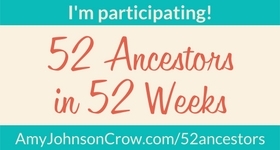 A second reading showed me that Anna also left bequests to names I recognized, including my great-grandmother Charlotte Flanders and her Heginbotham cousins. The big surprise was finding a stated relationship to “Alice McCormick, widow of my deceased uncle Peter McCormick” – and further, to “Annie McCormick, widow of my deceased uncle John McCormick,” and a large bequest to her beloved uncle Francis McCormick. Alice and Peter were my great-great-grandparents, but who were these other people? I clearly had work to do. I started with the will and worked backwards. But once my eyes were focused, I started seeing Conways pop up near my known relatives for years. Anna C. O’Connor was the widow of Thomas J. O’Connor when she died in January 1928. They are buried in Old St. Raymond’s Cemetery in the Bronx in a large plot that includes O’Connors, Conways – and McCormicks, including my great-great-grandfather Peter McCormick, who died in December 1898. He had originally been buried separately in the cemetery but Anna had his body moved to this new family plot when her husband Thomas died in 1926. Okay, that was weird, that someone I’d never heard of had my ancestor moved to her family plot. But it was also intriguing. Peter’s wife Alice was a Protestant so therefore banned from burial in this Catholic cemetery. Thomas O’Connor was a widower with a young daughter when he married Anna. His first wife was Elizabeth Conway, Anna’s younger sister, who died of tuberculosis in 1912. Both were from Irish immigrant families; Anna and Elizabeth were born in England before the Conways migrated to the United States, where they lived in the Bronx. When I found them in the 1900 census, my heart skipped a beat to see who was not only living near them but in the same house: my great-great grandmother Alice McCormick, and her daughter and son-in-law, my great-grandparents. And two house numbers down the street we find John and Bridget O’Connor with their son Thomas, who later married both Elizabeth and Anna Conway. Wow. My hypothesis was that Mary Conway was the sister of Peter, John, and Francis McCormick, based on relationships stated in Anna’s will. Death certificates for Elizabeth Conway O’Connor, Anna Conway O’Connor, and their brother Francis J. Conway all list their mother’s maiden name as Mary McCormick, which confirms it. I knew that Peter was indentured to a stone mason in Glasgow in 1856 but that the indenture was broken by the death of his master. I found him in Liverpool in the 1861 Census, listed with parents Patrick and Catherine McCormick with their children Mary, Francis, Peter, and John. All of the men were stone masons. All of those names appeared in Anna’s will and/or census and death records. The 1880 Census finds the Conways and McCormicks at 347 76th Street in Manhattan, living in the same building and with consecutive family numbers. Both Mary Conway and Catherine McCormack are listed as widowed, which is new information and can help me locate death records for their husbands. Mary is living with her children Francis, Elizabeth, Ann, John, and Lewis – all familiar names from Anna’s will and confirmed by other census records. Catherine McCormack has sons Frank and John, both stone cutters. Ages are consistent with other records. It appears that widowed Mary Conway was living near her widowed mother and brothers. Peter McCormick, now married, lived a few blocks away on Lexington Avenue. Anna’s brother Francis J. Conway, also a builder, was a witness to his uncle Peter McCormick’s naturalization and oath of allegiance in October 1886. So now the question is, who was Catherine McCormack? I know she was born in Ireland and I knew who her children were but I didn’t know her maiden name. Her son Peter (my great-great-grandfather)’s 1898 death certificate lists her name as “Catherine” but no surname. Now armed with additional names, I am researching death certificates for her other children. Francis McCormick’s record shows her maiden name as Catherine Murray which is lovely, but it only one source; I am still searching for records for her other children. However, the name also gives me a starting point for other research in New York, England, and Ireland. The Conways and McCormicks overlapped in their residences, occupations, relationships, and even their resting places. I had never heard of Anna Conway but her little will allowed me to open new doors and uncover connections I would have missed. Categories: Genealogy | Tags: ancestors, conway, genealogical research, McCormick, mystery, o'connor, profile, research | Permalink. William Charles (“Bill”) Flanders was born on 5 October 1900 in Belleville, New Jersey, the only child of Englishman William John Flanders and his wife Charlotte Ann McCormick, who was born in New York City. He was the fourth William Flanders in his line, following father William John Flanders (b.1865), son of William Flanders (b.1834), son of William Flanders (b.1811). The legacy of the name died with him, as he had only daughters, neither of whom were named William. Good thing! The Flanders family settled in Newark, New Jersey, just two miles from Belleville, where Charlotte’s extended Heginbotham family lived. In 1905 they were living at 276 Riverside Avenue but moved in 1907 to a new 5-bedroom house in the quiet Forest Hill residential neighborhood. The home at 916 Lake Street remained in the family for almost 70 years. Bill Flanders had a high school education, attending Barringer High School in Newark, and was still living at home when his father died in April 1925. Bill cared for his mother in that home for another 40 years until her death in 1967. The year after his father died, he met the vivacious Marion Stokes Cooke and married her on 10 March 1927 in Brooklyn. They had two daughters, Jane Anne Flanders born on 12 October 1929 and Alice Margaret Flanders, born 9 March 1931. Bill was a salesman, as was his father, and he changed industries several times. In 1920 he was working as a purchasing agent for a steel company. During the dark days of the Depression in 1930, he was a salesman for a motor company. But by the 1940 census, he was sales manager for a meter company, an industry he stayed with until he retired in 1965 as president of the Gamon-Calmet Meter Company. Bill hired his daughter Margaret’s husband (my father) in 1952 and taught him the business. Bill Flanders as a Roman Soldier – we dont’ know why! My grandfather didn’t have hobbies that I knew of, but he was an active member of St. Mark’s Episcopal Church in Forest Hill, serving on the vestry for many years as well as church treasurer. One of his jobs was to buy Christmas trees for the church every year, and he bought the one for his home at the same time – always a big tall tree that rose up next to the stairwell on Christmas Eve. Rector John Borton and his family were close friends of the Flanders and they socialized together in Newark and also Manasquan during the summers. The rector’s daughter even wore the wedding dress made by Bill’s wife Marion for her own daughters. Bill enjoyed the company of men but was the only one in a home filled with mother, wife, and daughters. Except for secretaries, his work life was a man’s world as well. He was a member of the Elks Club and also a 33rd degree Mason of Kane’s Lodge 55 in Newark. I don’t remember him ever talking about either one, but he was proud of both. He was also a director of the Philadelphia College of Osteopathic Medicine – another affiliation that didn’t make much sense to me but was important to him. He was a meat-and-potatoes man, eating relatively plain food but with a sweet tooth for desserts. During World War II, my mom remembers that they would go to a local butcher with bottles of liquor to get extra meat. His mother ruled the kitchen until the war, when she couldn’t figure out rationing; from there my grandmother took over. Her recipe box is full of favorite desserts which he loved. Pop was known for cooking steaks on the grill, trimming every inch of fat off and seasoning with olive oil, salt and pepper until they were “just so.” This was a familiar sight on Manasquan evenings – and very tasty, too. My grandfather was devastated by his wife’s death from cancer in 1960; it left a hole in his heart for the rest of his life. He continued to care for his mother until she died in 1967, leaving him alone in the house where he grew up. So in 1970 he sold it, moving to an apartment and later, to a retirement village near the Jersey Shore, which he loved. His world was small and he outlived most of his peers and friends, dying on 27 January 1983 at age 82. The day before he died, he told his neighbor that he had to decide whether to stay in New Jersey or sell his house to go to California to star in a movie. That always makes me smile. I remember Bill Flanders with love. We grew up nearby and saw him often until we moved to Kentucky in 1970. When I lived in Virginia, I made several trips a year up to see him and enjoyed asking family history questions and spending time with him. Although he lost weight and became gaunt in his final years, I remember him as round of face with the moustache he always sported. He is buried in East Ridgelawn Cemetery in Delawana, NJ, with his wife and parents. Categories: Genealogy | Tags: ancestors, flanders, grandfather, profile | Permalink.